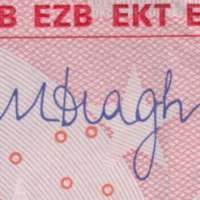 The ten euro note (€10) is the second-lowest value euro banknote and has been used since the introduction of the euro (in its cash form) in 2002. 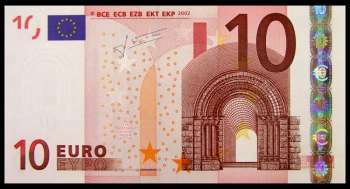 The ten euro note is the second smallest at 127 millimetres (5.0 in) × 67 millimetres (2.6 in) with a red colour scheme. 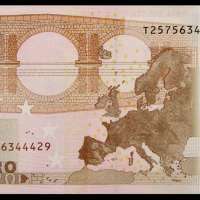 All bank notes depict bridges and arches/doorways in a different historical European style; the ten euro note shows the Romanesque era (between the 11th and 12th centuries CE). It is the architectural style of Medieval Europe, characterized by semi-circular arches. The Romanesque style in England is more traditionally referred to as Norman architecture.